An entertaining and intentionally goofy action film about a survival of the fittest kind fo game show in the future. A fun movie about a nihilistic future where America’s favorite gameshow is a do or die, survival of the fittest competition. In this game, contestants are thrown out onto an obstacle course designed to look like city streets, and are attacked by costumed stalkers. The public can’t get enough and they know all of the stalkers and even have their favorites. There have been many versions of this story over the years, with characters being thrown into an obstacle course for a life or death battle. 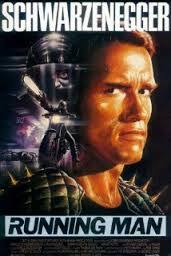 From Battle Royale to The Hunger Games , there is no question, the Running Man is one of the better tellings of this. The movie is dark and disturbing while at the same time, going for humor whenever it can. This film is definitely dated and feels very eighties, but it is a good, witty entertainment kind of time. The Running man is a fun, ridiculous, and intentionally corny romp. It’s a movie about one of those bleak futures where humanity has turned to television and to a single show where humans are sacrificed at the hands of super villain-like stalkers. The masses love this, thinking the runner or contestants are criminals getting what they deserve. They cheer on their favorite stalkers as if these men were famous wrestlers or pro athletes. Meanwhile, the contestants are running for their lives, through the streets of a city, knowing that their death is about to be nationally televised to a crowd who doesn’t know the truth about them. The movie begins with Ben Richards (Arnold Schwartzenegger) flying a military helicopter into a riot zone. He has about four other passengers in the vehicle with him, all of them armed soldiers. When an order comes in to fire on a civilian crowd of rioters who are unarmed, Richards refuses. That’s when the other men in the helicopter are given the instructions to take control of the helicopter, and they attack him. Richards escapes the chopper, but now he’s public enemy number one and a fugitive running from the law. At this point, Richards joins up with a rebellion group. Another movie would have had him go straight from the helicopter scene into being captured and thrown into the Running Man competition, but this film takes its time. He makes two friends in the rebellion, who don’t exactly trust him at first, but grow to change that. There are a couple of attacks, and Richards decides it’s time to leave the group and go find his brother who will offer him a safe place to stay until he can leave the country. Richards goes to his brother’s apartment, only now there is a woman living there. This woman knows who Richards is, having just seen a story about him on the news. He ties her up and holds her hostage (why is it the good guy always seems in the right when he does something like this?) Then he takes her to the airport to serve as part of his cover and disguise. They will pose as a married couple going away together on vacation. Only this woman, Amber, seizes the moment during an opportunity to escape, and she screams to the authorities about who Richards is. They now chase him down and catch him and bring him to the Running Man. 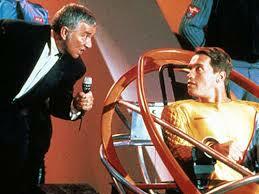 Richard Dawson plays Damon Killian, the man who hosts the Running Man and is America’s favorite celebrity. He plays with the crowd, often just walking over to people and loading them up with prizes. Behind the scene, however, Killian is a real jerk. We see this a couple of times like when a man is mopping the floor and runs into Killian and Killian demands that this man is fired. Another example comes when the makeup person is working on him and nearly touches Killian’s hair. The authorities have manipulated lots of different tapes of Richards so that they can fabricate a story about him and get the crowd on their side. First, there’s the tape of him in the helicopter. This is cut together to look like Richard wanted to open fire on the crowd and the other men in the chopper tried to stop him. Then there’s a story that comes on the air about how Richards killed a number of security agents when he arrived at the airport. Amber sees this story on the news and knows it’s not true, since she was with him there. She starts investigating, and soon she is captured and thrown into the Running Man games as well. So are Richards’ buddies from the rebellion. The two guys from earlier in the movie are captured and dropped into the pit. And that’s when the fun begins. First, there’s a toboggan/alpine slide like chute that contestants must get sent down and this thing is incredibly cool. It is like a giant tube that they are shot through at incredible speeds. I like how even this sequence is done in detail and not just a quick throw away shot. When the characters get spit out, at te bottom of the chute, their scooter that they are strapped to goes flying into a net, and then they get out and start running. Richards and his friends are on the run when the first stalker comes their way. This is Professor Sub Zero. He dresses in hockey pads, skates, and hockey mask, and a giant goalie’s stick. Not the most creative costume. And he tries to drag his opponents across the ice and into nets. Richards gets the better of him and the crowd is stunned. We see Killian talking to them, saying this was bound to happen sooner or later, but what about the previous winners? Didn’t they kill stalkers as well? There’ a conspiracy going on about what happened to those winners after the show and whether or not they are in tropical paradises right now, enjoying their victories. After Sub Zero, it’s Bone Saw and Dynamo, a fat opera singing man who is all lit up like a Christmas tree and shoots electric sparks from his hands. These characters are fun. There’s even a guy who goes around shooting a flame thrower. The movie really feels like a videogame in this way, with each of these characters representing guardians in their unique costumes and creative powers. I wish some of the action between these characters, and fights, went on a little longer, but they are all a lot of fun. The movie is not anything special, because at this point in time, we’ve seen tons of films with the same survival at all costs – gameshow kind of premise. There is Battle Royale, Surviving The Game, The Purge, and The Hunger Games. Still, there’s something to be said for the original version, here, with it’s complete eighties feel, including the costumes and the villainous characters. Somehow a movie like this feels more authentic than any of the others. Maybe it’s the lack of computer effects in place of practicality. The Running Man really does a nice job of establishing the futuristic society with new rules and ways of life. I love the way the government is so corrupt that they manipulate the truth and use editing software to alter footage and lie to the public. This is cool stuff.